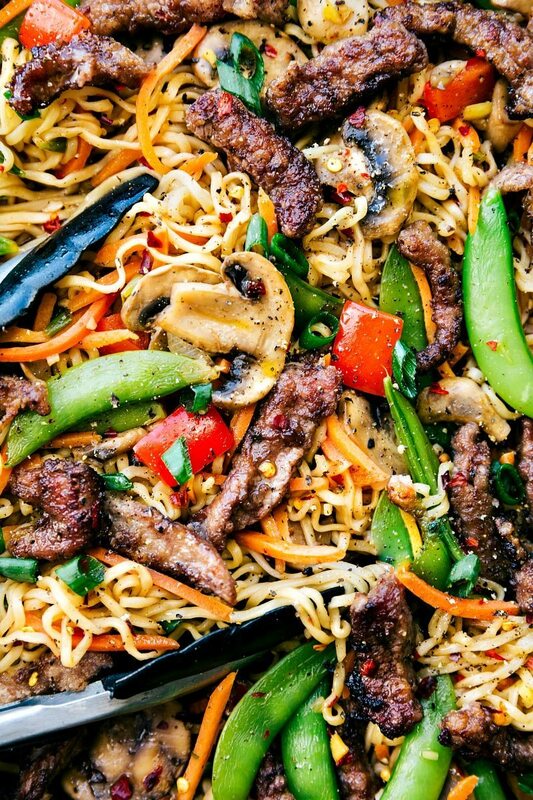 Garlic Beef and Veggie Ramen is an easy dinner recipe that is so much better than take-out! I’ve started giving the toddler a few more chores around the house — simple things that he can easily complete in not too much time. But instead of ever finishing these tasks in a few minutes, they get drawn out for ridiculous amounts of time. The other day, when he knocked over a box of cereal, I asked him to clean up the spilled cereal and throw it away. He slowly and dramatically cleaned up three or four pieces and then stood there and said in the sweetest, most innocent voice, “Mom, I think you need to clean these up, because I really need a break.” ? I have no idea where he’s come up with these excuses, but I’m not doing a great job discouraging them when they make me bust out in laughter. So when it came time to eat dinner and he told me he “need(ed) a break from carrots,” all I could do was laugh and tell him he didn’t have to eat the carrots. That turned into him also removing the mushrooms, peppers, and the beef. So basically he ate ramen and snap peas for dinner and couldn’t stop telling me how much he liked it. ? This dish does have a few steps to it, but it comes together pretty quickly and flows well. Most is done all in one skillet (or a wok if you have one), but you will use an extra pot to cook the ramen in. Technically you can cook the ramen in the sauce at the end, but I preferred the taste/texture better with the noodles cooked separately (especially if you are going to have leftovers!). Speaking of the ramen noodles, you’ll barely boil them to keep them from getting mushy. The package says to cook them for 3 minutes, but I remove them right at 2 minutes and then drain and rinse in cold water. This way when you mix the noodles with the sauce and other ingredients, it has a chance to get a little more tender without getting mushy. ?? I discard the seasoning packets in the noodles, but you can use those in place of the beef stock/broth (just add 1 cup water), but beware of the dish being a bit salty if you use those packets. And definitely make sure to use low sodium soy sauce to avoid an overly salty dish. PIN THIS RECIPE to your recipe board! 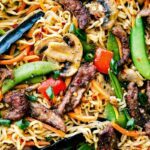 Garlic Beef and Veggie Ramen is an easy 30-minute dinner recipe that is so much better than take-out! OPTIONAL: marinade the meat. Toss together 1/4 cup soy sauce, hoisin sauce, and 1 tablespoon minced garlic. Very thinly slice the flank steak against the grain into 1/4th inch thick strips and then into 2 inch pieces. Place the steak pieces in the marinade and set out at room temperature for 20-30 minutes. OR cover tightly and place in the fridge for up to 8 hours. If you want this to be a true 30-minute dinner, skip this step! While the meat is marinating, prep and cook the veggies. 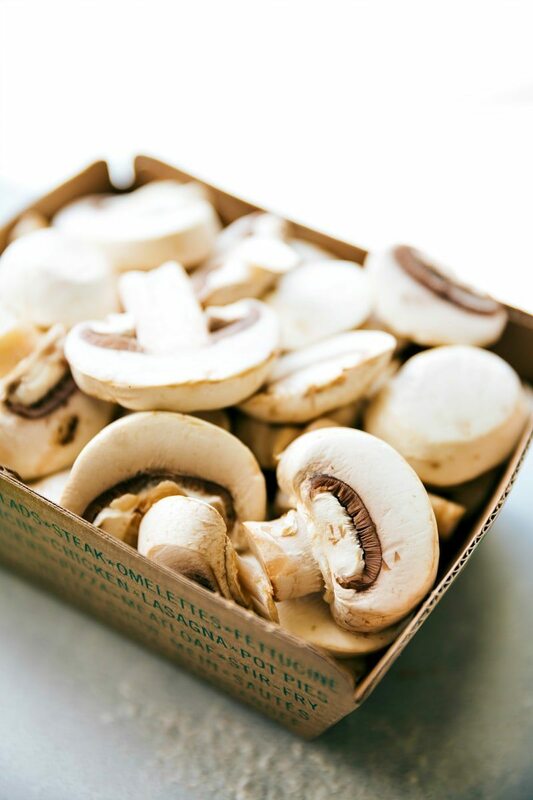 Place 1 tablespoon oil in a large skillet or wok and add in the sliced mushrooms, snap peas, shredded carrots, and chopped red bell pepper. Cook over medium high heat until crisp tender and transfer to a bowl/plate. Remove the meat and drain off any remaining marinade. Toss the meat to coat with the cornstarch in a large plastic bag. Alternatively use your fingers to work the cornstarch into the meat. Make sure all of the meat is well coated in cornstarch. Add another tablespoon of oil. Heat until the oil is shimmering and then add in 1/2 the beef so it can be in a single layer. Cook without moving until the beef is well seared, about 1-1/2 minutes. Continue cooking while stirring until the beef is lightly cooked but still pink in spots, about 30 seconds. Transfer to a plate. Add in the last remaining tablespoon of oil to the pan and heat until shimmering. Add the remaining beef and cook without moving until the beef is well seared, about 1-1/2 minutes. Cook for another 30 seconds. Transfer the rest of the beef to the plate. 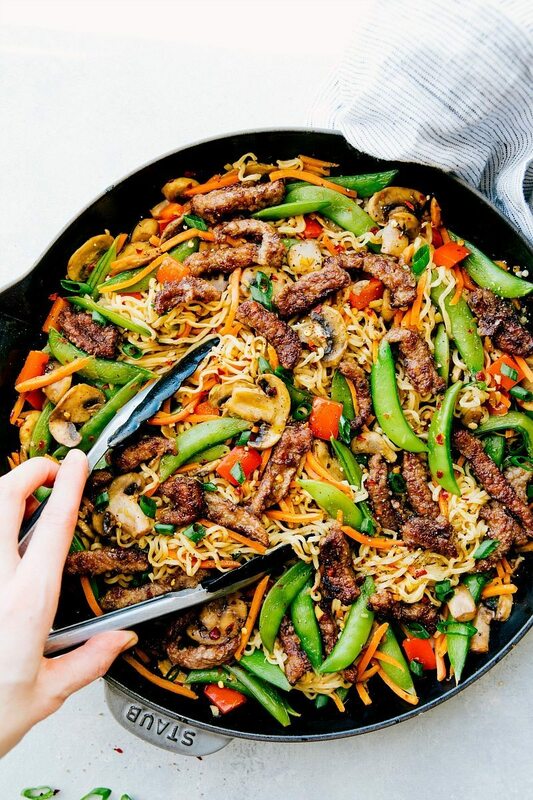 In that same skillet or wok, add in the sesame oil, remaining 1/2 cup + 2 tablespoons soy sauce, beef stock or broth, remaining 1 and 1/2 tablespoons minced garlic, minced ginger, brown sugar* (add to your taste preference, we like a lot of sugar in this dish), and red pepper flakes. Stir and cook (uncovered) over medium heat until sauce thickens a bit and reduces by about a third (about 10-12 minutes). You don't want to reduce it too much so it can still generously coat all the noodles & veggies. In a small dish, whisk together remaining 1 teaspoon cornstarch with 1 teaspoon water until smooth. Whisk into the sauce. While the sauce is reducing, boil a small pot of water and cook the ramen noodles for exactly 2 minutes. Drain and rinse in cold water. Add the cooked veggies, cooked meat, and drained ramen noodles into the sauce. Toss to coat and top with green onions. Add some cracked pepper and additional red pepper flakes if desired. Enjoy immediately. I feel like ramen is having a moment right now and my college-self couldn’t be more thrilled. I love this recipe and hey if my kids only eat the noodles and snap peas (picky eaters that they are) I’ll take it!! Made this for dinner the other night, my husband and I both loved it! I was JUST noticing at costco on sunday that they have a big bag of ramen style rice noodles! Looks like i may be going back to get some…yummy! Can we use other noodles besides ramen? Or brown rice? Sure! 🙂 I’d stick with noodles over rice because the sauce might be overwhelming with rice. However, if you added the sauce + beef + veggies OVER the rice (instead of stirring the rice in) I think it would be great! hey girl -this looks so yummy! Absolutely delicious and the colors are amazing vibrant! You could use rice noodles instead of ramen. I think the flavors are more geared to beef, but chicken should be good too. If you use chicken, I’d use chicken broth instead of beef broth. Enjoy! and I have never seen flank steak in the meat department, is there another cut I can use? Thank you so much! This came out perfect! Great tip onnundercooking the noodles. Probably could have reduced the sauce more but all in all, DELICIOUS and picture perfect! 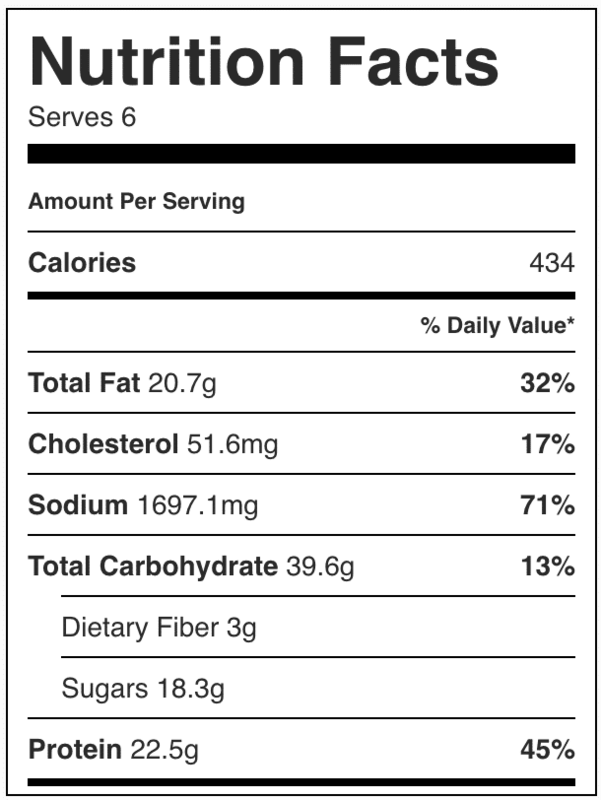 Want to know if you use the package spice in the ramen noodles??? I just made this for lunch. The sauce was SO salty. I used low sodium soya sauce so I’m not sure what happened. If I were to use less soya sauce next time should I just substitute the soya sauce for more beef broth? Did you use the sauce packets from the ramen? Did you use low sodium beef broth? The dish looks delicious but why is it impossible to print out. I have tried with the cheese cake cookies and now this one and it just won’t print. Can you help me? Hi Barbara, I am so sorry you’re having some problems printing. I can’t replicate the problem, but I am having my tech guy look into it 🙂 Perhaps try using a different browser, clearing your cache, or you could also copy the recipe and paste it into a word document and then print that! Hi Linda! Is your current browser up-to-date? Alternatively you could try using a different browser. Unfortunately I can’t replicate the problem so I’m not sure how to help! If all else fails, you can copy the recipe and paste it into a word document and print it from there! Can I use ground ginger instead and how much if i can? I can’t find minced ginger. I made ​this recipe and it turned out so good!!! Made a few changes; only half of the soy sauce, a new york steak, a package of frozen stir fry vegetables, a can of mushrooms, one packet of beef Ramen in a cup of water instead of the beef broth, used powered garlic and ginger, and easy on the red pepper flakes… This recipe makes lot! could have made it in half. Just made the delicious dish (without the brown sugar) and it was everything. Thanks for sharing!! So happy you enjoyed it!! Thank you so much for the comment Ronica ? Your picture shows green onions, but they’re not in the ingredient list. How many would you recommend adding, and when? They’re an optional addition — you can add them at the end if you’d like! 🙂 Enjoy! 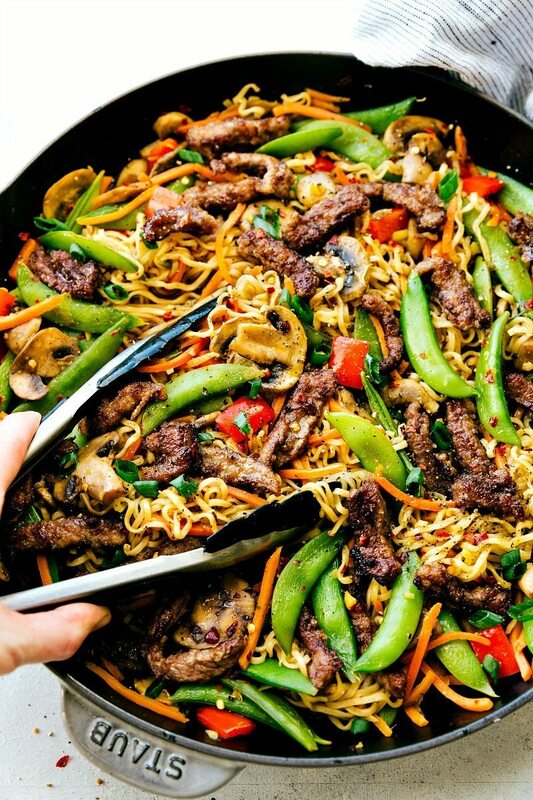 Made this for dinner tonight with a couple small substitutions – we didn’t have ramen so used lo mein noodles and ran out of minced garlic and ginger so went a little light on those. I used a frozen pack of oriental stir fry veggies and it was perfect. This was DELICIOUS. My husband devoured it and both our boys (ages 1 1/2 and 2 1/2) ate every bite and they rarely eat veggies! Thanks for a fantastic recipe that will for sure be added to our weeknight rotation! Firstly, it looks absolutely delish. Is there a gluten free way this can be done, as both my wife and daughter are coeliacs. I also have Celiac Disease. When making Asian dishes I buy rice noodles from my local Asian store. The Three Ladies brand is GF, and says so on the package. Make sure you are using a GF soy sauce (most soy sauce has wheat in it). Same with the Hoisin sauce. I think I have Googled a GF recipe for Hoisin sauce before and it turned out pretty tasty. Sorry I don’t remember the website.. All the other ingredients should be naturally GF. Good luck!! I can’t wait to make this also!! Looks delicious , is this farely inexpensive for all the ingredients would you say ? I wouldn’t say it’s the cheapest meal you can make. It definitely depends on the meat you get! Brandi, i’m so glad to hear! Hahah that happens around here too, i’m glad you guys enjoyed! Big hit! I substituted green beans because we didn’t have snap peas. 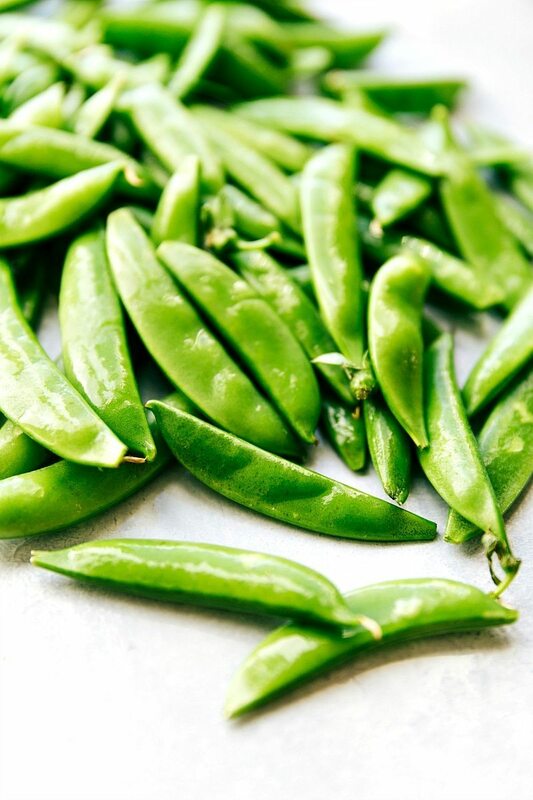 Will try snap peas next time. Will definitely make this again. Delicious! Hi, this recipe looks amazing. However would it work if I left out the red pepper flakes? I have a mild allergy to Chilli peppers and try to avoid them at all costs? Would this work with chicken and if so would it be best to sub chicken broth for beef? We are not fans of sesame oil…could you just substitute vegetables oil….or any suggestions? This was amazing! A friend recommended it and I made it on a whim, no mushrooms but oh my yum! It’s going in my recipe book to keep. It was a bit more spicy than I’d anticipated but I’m a wuss and my kids enjoyed it too! I’m so thrilled this was a hit and it makes it in the recipe book 🙂 Thanks for the comment Amanda! Made this tonight! The whole family and I loved it!!! Thank you so much for such an awesome recipe!!! Made this for dinner tonight. Huge hit with hubby and 16-year-old son (and me!). I omitted the sugar completely, as my husband isn’t a fan of sweetness with meat. Still incredible; it’s going in the rotation! Thanks for this keeper! This is definitely not a 30 minute meal but I must say all of the prep work paid off in taste. This recipe is delicious! Hi. Do I need to add brown sugar, or can I leave that out? I had high hopes for this but it was almost too salty to eat. I used low sodium soy sauce and beef broth. And it was not a 30 minute meal. It took me over an hour to make this. So bummed. If it was less salty, it would have been delicious. I’m so sorry to hear that Lisa 🙁 I hate when a recipe doesn’t turn out how I was hoping. If you do try it again you could reduce the soy sauce to omit some of the saltiness. I used chicken instead of beef. Chicken broth and 2 tablespoons of brown sugar which was plenty. Also some chunks of onion- delicious! I am literally the most well-meaning, yet worst cook on the planet…but even I didn’t mess this up. It was five sets of five stars with my husband and kiddos. Many thanks! Awe yay!! So happy to hear that 🙂 Thanks for the comment and review Leanne! Thinking Ill reduce the amount of sugar, but what would I need to do to make this more of a broth than reduced sauce? Just add a lot more broth and adjust the flavors as needed? This is so funny I made something like this similar using tofu and Japanese noodle it was good the snow peas were a snap! 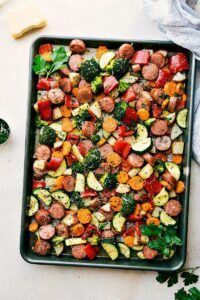 I make this recipe for my bosses (I’m a nanny) several times a year and I’ve made it once so far for my hubby & myself & I can’t rave enough about how delicious it is! Thanks for the terrific recipe! ? I don’t have any of these sauces/cornstarch/etc. so I’d spend at least $20 making this meal. This seems to be an issue with everything on the net – I tried making a nice Thai meal from a recipe online, spent $55 on ingredients, and it was ahh ok.. How can someone like myself (whose $55 of ingredients have all just sit and gone bad since then) still make some of these things without going all out? Your advice would be appreciated! So I first tried this recipe after stumbling upon it on Pinterest about a year or so ago and it was delicious! Since then I have made so many variations of it, and it’s still so tasty! I’ve used shrimp, and chicken on two separate occasions and it was still so good! 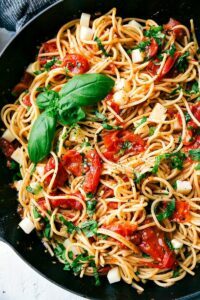 I have also used veggie noodles and whole wheat spaghetti noodles for a little bit of a healthier twist and no matter what the variation is I get compliments in the lunch room whenever I heat up my food. I have sent many of my friends the recipe and they love it too. 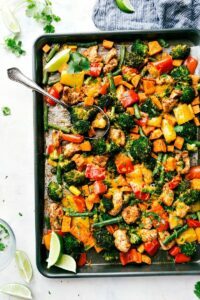 Thank for this recipe, it is definitely a recipe I use consistently and I will continue to use for years on! This was amazing! I doubled the recipe for my family of 6. Used coconut aminos instead of soy, coconut sugar, millet/brown rice ramen noodles from Costco, and tri tip steak. My kids said it tasted like Panda Express, but even better! I made this two nights ago, as I’m on a low carb diet, I left out the noodles and substituted bean sprouts and bamboo sprouts. I also cut the brown sugar by about 2/3s. It turned out pretty nice even if I do say so myself, and I will make it a regular dish when I do Chinese. The recipe looks great, and I think I’ll try it soon. I wanted to ask if you had made variations with this recipe substituting pork or shrimp for the steak? I’m reducing my red meat intake because (reasons), but it seems to me that either pork or shrimp would be an easy substitution. Chelsea, just a thought… judging by some of the comments, it seems to me that many people probably used the seasoning packet that comes with the ramen noodles. You might consider editing your recipe to say something about not using the ramen seasoning packet. What’s wrong with just the mixed vegetables and the beef with a little seasoning…..no sauce with soy sauce and brown sugar…and definitely no ramen noodles!…Do you know how unhealthy those things are!…They’ll give you diabetes!! Made this for dinner tonight. Turned out great! I substituted 2 tablespoons honey for the brown sugar. Yummy! I think I’ll use zucchini noodles next time for a healthier twist. Can I make this recipe in advance and freeze it? Like 2 weeks before I need it. Wait! Don’t throw the seasoning packets away. Mix a packet into sour cream for a really tasty dip. I would use 1 packet in 16 oz’s of sour cream, but you may like more or less. Also, you can add 1 packet to 2 coups of boiling water for a delicious broth! This was WAY too salty. It looked like it would be delicious but I found the sauce to be a bit rich. I didn’t use the ramen packets (msg is soooooo bad for you) either. It took much longer than 30 mins too. Sorry you didn’t love this Sarah!